CCAFS got off to a strong start in 2011, releasing high‐profile scientific results and helping achieve, in collaboration with multiple partners, a significant outcome in the global climate change negotiations. The full set of reports from Centers, Themes and Regions on which this CRP synthesis report is based are available here. CCAFS. 2011. Annual Report to CGIAR Consortium. 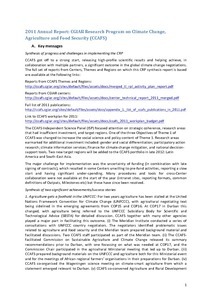 CGIAR Research Program on Climate Change, Agriculture and Food Security (CCAFS). Copenhagen, Denmark: CGIAR Research Program on Climate Change, Agriculture and Food Security (CCAFS).